Marijuana is a green, brown, or gray mixture of dried, shredded leaves, stems, seeds, and flowers of the hemp plant (Cannabis sativa). Before the 1960s, many Americans had never heard of marijuana, but today it is the most often used illegal drug in the United States. 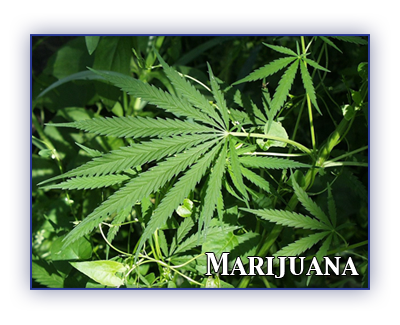 Cannabis is a term that refers to marijuana and other drugs made from the same plant. Strong forms of cannabis include sinsemilla (sin-seh-me-yah), hashish (“hash” for short), and hash oil. All forms of cannabis are mind-altering (psychoactive) drugs; they all contain THC (delta-9-tetrahydrocannabinol), the main active chemical in marijuana. They also contain more than 400 other chemicals. Because of the lower blood pressure and higher heart rate, researchers found that users’ risk for a heart attack is four times higher within the first hour after smoking marijuana. Marijuana contains more carcinogenic hydrocarbons than tobacco smoke and because marijuana smokers usually inhale deeper and hold the smoke in their lungs longer than tobacco smokers, their lungs are exposed to those carcinogenic properties longer. One study found that marijuana smokers were three times more likely to develop cancer of the head or neck than non-smokers. Many researchers believe than smoking marijuana is overall more harmful to the lungs than smoking tobacco.